A man suspected of driving a stolen pickup truck led police on a pursuit but was arrested Monday when he crashed into a house in Escondido, police said. 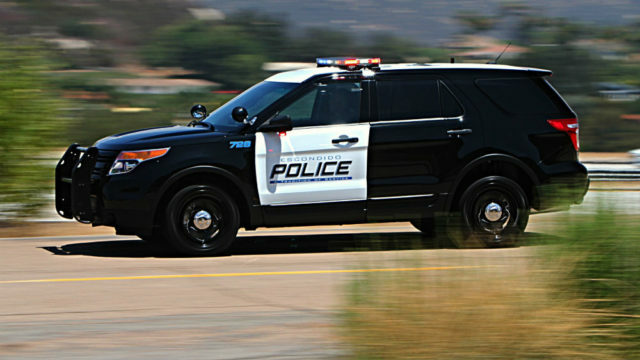 The series of events began around 2 a.m. when an officer near the intersection of East El Norte Parkway and North Ash Street spotted a Toyota Tundra pickup truck that had been reported stolen, Escondido police Sgt. Ryan Banks said. A patrol officer tried to pull over the stolen truck, but the driver fled. The pursuit ended around 10 minutes later when the truck crashed into a house in the 500 block of Veronica Place, Banks said. The man driving the car and a woman in the passenger seat, both 18, were uninjured in the crash, Banks said. The driver was arrested on suspicion of vehicle theft and felony evading after being medically cleared for booking, Banks said. The woman was detained but later released, Banks said. An estimate of the structural damage to the house was not immediately available.